Among the many memorable characters populating Charles Dickens's novel Bleak House is the formidable Mrs. Jellyby, a woman living in London who resolutely devotes every waking hour to a project in Africa that she refers to as the "Borrioboola-Gha venture." Her goal is the resettlement of impoverished Britons among African natives, all of whom will support themselves through coffee growing. Mrs. Jellyby is convinced that no other undertaking in life is so worthwhile or would solve so many social problems, in both Africa and England, at a stroke. 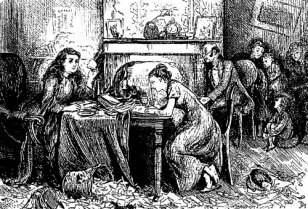 Dickens's interest is not in the project, however, but rather in Mrs. Jellyby, a person so wedded to her work that she has no time for her husband or their several children, with the exception of Caddy, her eldest daughter. When we meet Caddy, we see her conscripted as her mother's secretary. Ink-spattered Caddy puts in nearly as many hours as her mother in the daily task of answering letters and sending out literature about Borrioboola-Gha. Unwilling conscript that she is, Caddy has come to hate the very word --Africa -- or any phrase that has the remotest suggestion of idealistic causes. For her, "cause" is another word for the ruin of family life. Meanwhile Mr. Jellyby is a man on the edge of suicide. Though he is still surviving his despair as the book closes, in our last glimpse of him he is resting his head despondently against a wall. In the book's postscript, we learn that the Borrioboola-Gha project failed after the local king sold the project's volunteers into slavery in order to buy rum. Far from being deterred by this grim outcome, Mrs. Jellyby quickly finds another cause to occupy her time, "a mission with more correspondence than the old one," thus providing new vistas for a permanent campaigner. While few in the peace movement so radically neglect those in their care, unfortunately I cannot think of Mrs. Jellyby merely as a gross caricature. When my wife and I talked about her recently, we could think of several people, of both sexes, resembling her in many details: people with a certain legitimate concerns and noble goals who engage themselves so fully that their fixation wrecks havoc in the lives of those around them, driving many people they intended to influence, even their own sons and daughters, in the opposite direction. I recall one activist who wasn't able to attend his daughter's wedding because he felt obliged to take part in a peace demonstration that day. Another man, more gandhian than Gandhi, also springs to mind. He was left in charge of the Manhattan office of a group called the Committee for Nonviolent Action while the staff was away protesting nuclear weapons. In their absence he nearly starved the office cat to death because he was conscientiously opposed to the domestication of animals. Whatever food that highly domesticated cat found during those austere weeks, it was not from this pacifist's ideology-governed hand. I wonder if the Mrs. Jellybys of this world, dedicated in theory to compassion as the bearers of utopian visions, are not at a deeper level driven by rage with those around them, perhaps especially their own families? By taking up a virtuous cause, they can punish their spouses, children and relatives with a clear conscience. After all, they are doing something entirely noble, so much more important than caring for the people they live with or are related to. Their impatience and neglect or abandonment of others around them is a necessary, even God-endorsed price of serving a higher purpose. One of the problematic questions about nonviolence is the inevitable involvement of hidden aggressions and provocations. I think this is especially true when there are... elements that are not spiritually developed... There is the danger one observes subtly in tight groups like families and monastic communities, where the martyr for the right sometimes thrives on making his persecutors terribly and visibly wrong. He can drive them in desperation to be wrong, to seek refuge in the wrong, to seek refuge in violence... In our acceptance of vulnerability, we play [on the guilt of the opponent]. There is no finer torment. This is one of the enormous problems of our time... all this guilt and nothing to do about it except finally to explode and blow it all out in hatreds, race hatreds, political hatreds, war hatreds. We, the righteous, are dangerous people in such a situation... We have got to be aware of the awful sharpness of truth when it is used as a weapon, and since it can be the deadliest weapon, we must take care that we don't kill more than falsehood with it. Because of my particular life experience, I tend to think especially of the peace movement, but it hardly matters what movement it is that one belongs to: left or right, red or green, nationalist or trans-nationalist, large or small. It could be pacifism, feminism, Marxism, anarchism, vegetarianism, human rights, animal rights, some political party or one's religion. In any case, ideology rather than love and compassion can easily become the driving force in one's life. Cause-directed ideology also serves the function of keeping its users in a constant state of guilt and anger: guilt because one can never become the utterly dedicated person the cause requires and expects of its adherents; and anger because there are never enough people ready to join the group -- and always those who either stand in opposition or don't seem to care. Many saints of the last hundred years would readily recognize Mrs. Jellyby and could identify her real-life counterparts. In Russia, for example, in the mid- and late-19th century there was an explosion of radical movements which, while dedicated to various social reforms, abandoned care of neighbor and relative as a bourgeois waste of time. Something similar, though not nearly so pathological, occurred in many countries in the 1960s and 70s. No matter what the time or place, ideology draws borders: the community of Us versus the adversary, Them. We can more or less comprehend the Us community's content and shape, although in the end it defines our shape. In contrast, God is not comprehensible or definable. God is both unbearable light and infinite darkness. The Church helps protect its members from ideologies and the us-versus-them way of seeing ourselves, if only by placing us in a community in which the Eucharist is at the center. Eucharistic life is something social movements generally avoid. Cause-driven movements aren't drawn to sacramental mysteries, still less to the mystical life. In many groups dedicated to peace and justice, even ones with a religious basis, the word mysticism, if said at all, is pronounced with derision, as if to say: the true social activist has no time to be a mystic, for mysticism cannot possibly have anything to do with untying the knots in our disordered world. There is too much to be done, too many urgent needs to be met, to permit indulgence in liturgies, religious rites, penitential activities, examinations of conscience, periods of silence and withdrawal, etc. If religion is tolerated at all, it must be kept in a well-governed corner under the strict regulation of ideology and peer-group control. This kind of movement climate, of course, remains spiritually shallow and inevitably results in many cases of burn-out -- psychological and physical exhaustion that makes it impossible for the social activist to continue. In such cases burn-out might be seen as a healthy reaction to an unhealthy social situation. Perhaps we are at a moment in history, with many ideologies in a state of collapse, when we can imagine that a deep, disciplined spiritual life would lay a foundation for social action that would not only produce useful results but would also refresh us day by day as we seek to build up a nonviolent social order? God is love. We move toward God through no other path than love itself. It is not a love expressed in slogans or ideologies, but actual love, love experienced in God, love that binds us to those around us, love that lets us know others not through ideas and fears but through God's love for them: a way of seeing that transfigures social relationships. Jim Forest is secretary of the Orthodox Peace Fellowship. His books include The Wormwood File: E-Mail from Hell , Praying with Icons , Confession: Doorway to Forgiveness , and Ladder of the Beatitudes .